8/28/2016–KILL DEVIL HILLS, NC–National Aviation Day is observed on August 19 each year in the United States. It was established by President Franklin D. Roosevelt in 1939 to honor the pioneer of aviation, Orville Wright, on his birthday. Orville Wright made his 1st flight at the site of the Wright Brothers National Memorial in Kill Devil Hills, NC. The National Park Service and First Flight Society commemorates this event by hosting an annual First Flight celebration here. 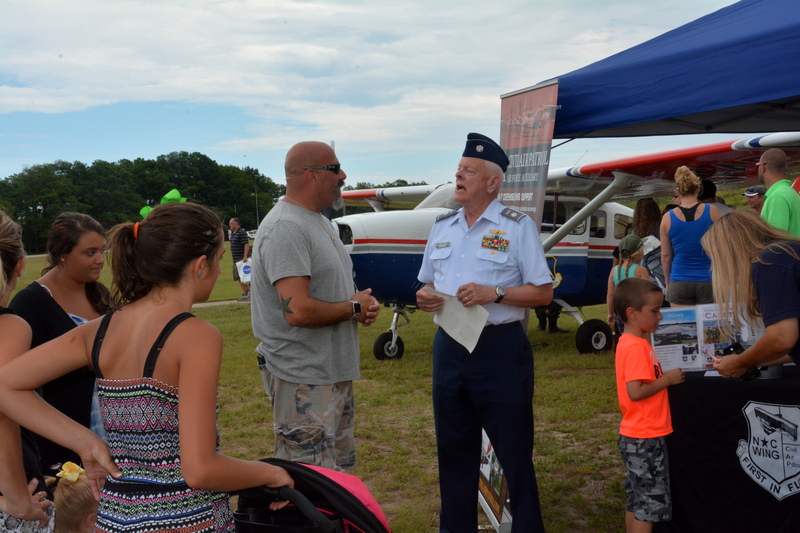 Civil Air Patrol was invited to participate in this year’s First Flight event. We had two CAP airplanes, a Cessna 206 and 182, on static display for public viewing; and a recruitment booth set up with brochures and stickers to distribute. We also had several CAP vans with groups of cadets from Elizabeth City and Cherry Point ready to assist with parking detail and crowd control. Lt.Col. Simmons and I were very busy all day educating people, young and old, about what our organization is all about and what it offers to the community. Most people who stopped by our booth had never heard of Civil Air Patrol. Some expressed an interest, but were reluctant to inquire since they lived out of state. Once they learned CAP is a nationwide organization, they were quick to fill out an information card. By the afternoon, there were a lot of people standing around our booth eager to learn about CAP, while others were standing in line to view the airplanes with C/2d Lt. Siciliano and C/Capt. Stange, both from NC-145. The First Flight celebration also included many educational exhibits by NASA, NOAA, NC DOT Aviation, and United States Coast Guard. There were many interactive activities and special presentations, as well as a flyby of military aircraft. This event was a very successful recruitment opportunity for CAP. Needless to say, I was very excited to know that I will be occupied for the next week sending out a record number of emails across nine states to people who want to know more about our organization. Many thanks goes to Lt. Col. Dion Viventi, Lt. Col. Jim Elliott, Maj. Chris Bailey, Capt. Kathy Nicholas, Maj. Thomas Rooks, Capt. Neil Fowler, Col. Simmons, C/ 2d Lt. Siciliano, C/Capt. Stange, and cadets from Cunningham Field and Elizabeth City for all your hard work and time dedicated to make this event one for the books.